Kudos – these people deserve mention for their achievements in sailing and with Ockam instruments. 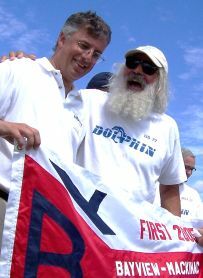 The yacht ‘Dolphin’ and its crew are folk heroes around the Great Lakes. Despite her 35 years, this one-off Mull 54 has finished in the money 11 out of the last 18 Bayview Macs amongst many others. Mike is her tactician and speed-king, and applies his business analysis and technical problem-solving skills to the art of winning sailboat races. In 1987, after attending an Ockam U, he sold his dad and team patriarch on the ideas and the need for new instruments to implement them. Then he bought and installed an Ockam system himself and trained the crew in its use. They are still using that same system. “If you don’t measure it, you can’t improve it. A thorough characterization of the boat’s performance is responsible for our success. We’ve stayed competitive for the last 20 years by continually refining everything: our technique, deck layout, tuning, sail design, and sail trim. Collecting higher quality data has allowed us to make higher quality decisions and focus our limited resources for maximum benefit. Accurate, real-time information is provided in a layered fashion to crew members, based upon their function. Here-and-now information is provided to the driver and trimmers to validate the feedback provided by the boat, keeping him focused upon managing boat speed. Tactical and strategic information is delivered to the brain trust without distracting the boat speed masters. Peter needs no introduction. He has been afterguard in four America’s Cup campaigns with 2 wins, coached the Olympic sailing team, commentated on ESPN, been top ranked in the PMRC for 5 years and has published 3 books on sailing. A graduate of University of Michigan’s Mechanical Engineering program, Matt has participated in two America’s Cups, with expertise in navigation, electronics and project management. His recent article in Sailing World magazine explains how to use instrumentation and knowledge of your boat’s polar data to sail smarter and faster. He is currently perusing a graduate degree in business administration.